Dr Chandra Gupta (35), when he was studying in a Dental College, Bangalore went to a tribal village for training. As a student, he was pained to see how the poor people did not care for their dental hygiene. That prompted him to spend the weekends with the school children promoting the dental hygiene, even after his setting up private practice. He has also motivated some of his like minded doctors to do this service free of cost. So far, he has conducted around 625 dental camps free of cost in various schools and colleges. On an average, he conducts around 7 to 8 camps every month. Till date, nearly 2 lakh people have been screened by him. During the dental camps, he conducts a thorough dental screening, demonstrates correct brushing techniques, gives tips on dental hygiene. If there are any sponsors, he also provides ‘dental health pack’. In these days, when many of the doctors want to spend every minute of their time for making money, Dr Gupta wants to spend his leisure time with the children. 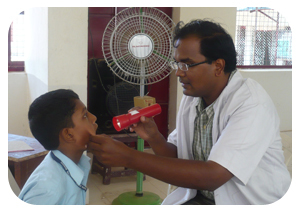 While many NGOs and medical universities organise general health camps, dental camps are very rare.